As a participant in the #Leadership20 online learning course, I am working on my digital portfolio – a big thank you to George Couros who is encouraging all of us to venture into this technological opportunity. Examining our own achievement of these standards is a great reflective opportunity. My format is based largely on what George has done in his portfolio. There are seven standards that Alberta Principals are expected to achieve. Placing them in a digital format allows for evidence to be linked to the standard; and it’s the evidence that is key to the portfolio. I believe in the importance of working and having fun with students to build great rapport and strong relationships. I Work to develop strong relationships with students, staff, and parents. 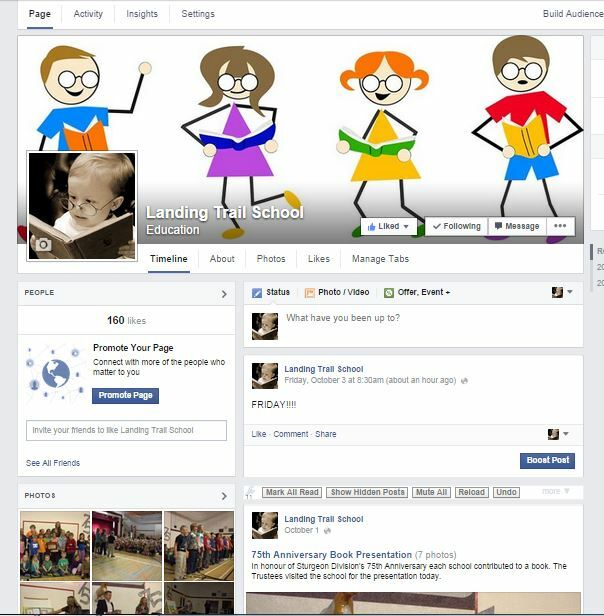 Open communication is very important and I have worked to develop the Landing Trail School FaceBook Page along with editing and contributing to the Landing Trail School Newsletter and contributing to the Sturgeon Spotlight in the past. I build strong relationships with our School Council and have helped them to communicate their school involvement through the use of the school website and school Facebook Page. LT has hosted a BBQ Supper for Parents, students, community members and staff. This was organized as a way to connect parents and students with the school and with the community. This was a great opportunity to welcome our students back to school, while also getting to know families on a more personal level. I work with students to become strong citizens in the community and take responsibility for their actions. I also believe that all members of the school community can be Leaders, and I, as well as my staff have shared that through the newsletters, our agenda and most communication with parents. I am open to feedback and improvement from all stakeholders to deliver the best opportunities for our students. Parent, staff, and student input is highly valued. When our current three year plan was being developed, opportunity was given to discuss the future of the division and LT as a community group. Through development of our Three Year Plan, Community and Parent involvement was encouraged and accepted. Promote work/life balance with myself and my staff.